Hydro rates, and the privatization of Canada's largest power utility, are a major issue in this election, with each party weighing in on what it would do with Hydro One. Hydro rates, and the privatization of Canada's largest power utility, are a major issue in this election. In the latest development, CBC News broke the story Tuesday morning that Hydro One's part-time board members gave themselves raises even as the utility's share price was falling. 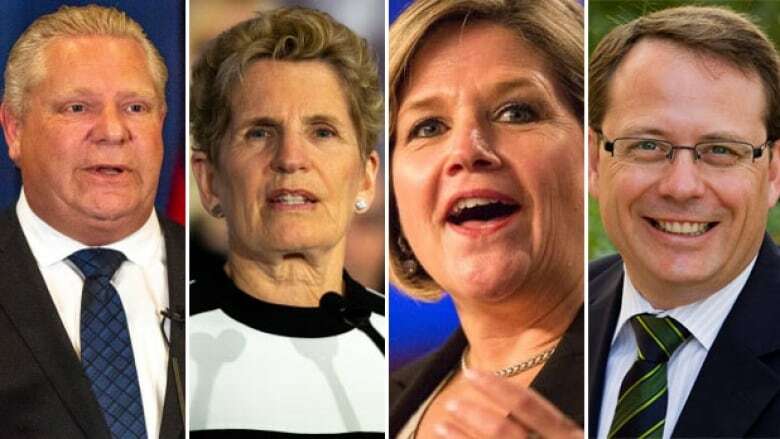 Each party has weighed in on the debate over Hydro One and executive compensation in the early days of this spring election campaign. As a quick reminder, here is where they stand on the utility and the prospect of bringing it back into public hands. The Liberal government decided to sell more than 50 per cent of Hydro One to raise funds for its massive transit infrastructure plan, a process that began in 2015. Without that majority stake, the utility is no longer subject to scrutiny by the province's auditor general or ombudsman. On Tuesday, CBC reported that Hydro One's part-time board members voted to give themselves tens of thousands of dollars in raises. The board had previously come under fire over compensation and severance pay for its top executives. Last month, the Liberal government asked for a review of executive compensation at the utility. On Tuesday, Liberal Leader Kathleen Wynne said that review would also include board compensation. According to the Liberals' election platform, there are no plans to reverse the decision about privatizing Hydro One. The NDP opposed the selloff of the utility from the beginning, going so far as to launch a public relations campaign. Leader Andrea Horwath said Tuesday if her party formed government, it would buy back the shares and bring Hydro One fully into public hands. Asked during a campaign stop how the scheme would work, Horwath would not guess at what that would cost or how long it would take. However, she said the shares would be paid for with dividends, acknowledging that the buy-back could take years to complete. Once back in public hands, the government would bring executive salaries under control, perhaps into the mid six figures, she said. The PCs have not released a detailed, costed platform, so the party's full plan for Hydro One remains unclear. Leader Doug Ford, who opposes privatization, calling hydro Ontario's "best asset," has been vowing to fire the CEO and all board members. But he has not said what compensation should be offered the people who fill those roles. On Tuesday, Ford supporters staged a protest outside Hydro One headquarters, where board members were meeting. Ford himself showed up to answer reporters' questions. Asked directly if he would buy back the utility, Ford said it was too early to say, he would have to "look at the books" after taking office. In announcing his party's platform on Monday, Ontario Green Party Leader Mike Schreiner – who also opposed the sale of Hydro One – would not commit to fully buying back the utility. He said such a move is not an effective use of taxpayer dollars, and committed only to buying back enough shares to give the government a controlling stake.